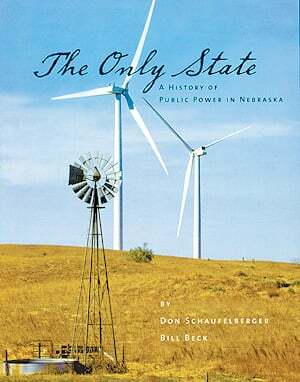 ("The Only State: A History of Public Power in Nebraska" by Don Schaufelberger and Bill Beck, 368 pages, $29.99). Nebraska prides itself on being the only all public power state in the nation. That means every electric utility is owned by the public and not by private corporations. The end result has been that its citizens pay some of the lowest rates and have a voice in how their electric utilities are run. That's the subject of "The Only State: A History of Public Power in Nebraska," written by Don Schaufelberger and Bill Beck. Schaufelberger is a retired president and CEO of Nebraska Public Power District. Beck, a professional history writer, helped him pen the book. NPPD paid for its publication. Schaufelberger, who will soon be 85, maintains that this is not a self-published book that serves the interest of NPPD, his former employer and the state's largest utility. Schaufelberger devotes entire chapters to Omaha Public Power District, Lincoln Electric System and the importance of rural electric districts. Also, he doesn't shy away from the power struggles between utilities, states and the federal government. The authors do a good job in chronicling the history of public power from the days of electric arc lights and municipal power plants to the development of hydroelectric dams and nuclear power plants. The book is rich in facts, events and people who devoted their lives to work for and against public power. People such as C.W. McConaughy, the longtime mayor of Holdrege, who was an ardent supporter of public power and irrigation districts in Nebraska. Lake McConaughy, the state's largest reservoir, bears his name. There's even a page on the late comedian Johnny Carson, whose father worked as a lineman. The history of public power is intertwined with the history of Nebraska, and Schaufelberger and Beck capture both through words and many old photographs and illustrations. This is not the first history book written about public power. Robert E. Firth published in 1961 his statewide history of Nebraska's utilities called "Public Power in Nebraska." Schaufelberger and Beck take off from where Firth left off and bring us up-todate with our current emphasis on wind energy development and a look to the future of public power. "Public power has been successful because it has never forgotten its roots in the fertile native soil of Nebraska," the authors write on one of the last pages. NPPD has donated more than 500 books to public libraries across Nebraska and other interested parties. Schaufelberger and his wife, Norma, also plan to donate books to each high school in Lincoln, including Lincoln High, where they both graduated in 1943. The book can be ordered online at www.nppd.com/theonlystate/.